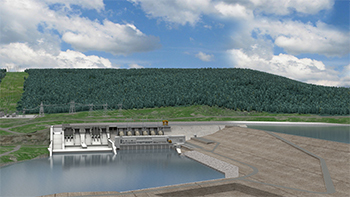 The generating station and spillways component of the Site C project will be procured through multiple contracts, including the civil works contract, powerhouse bridge crane supply contract and a balance of plant contract. Installation of and commissioning support for mechanical and electrical water-to-wires equipment supplied by others. Supply, installation and commissioning of mechanical and electrical equipment such as piping, pumps, cable tray, cables, etc. Installation of protection, control, telecom, security and similar systems supplied by others. Supply, installation and commissioning of the permanent upstream fishway. Design, supply, installation and commissioning of building systems, such as the fire detection and protection, HVAC equipment, domestic water, wastewater, etc. Completion of building interiors to the finished state. Supply of temporary construction works and decommissioning and site clean-up of the contractor’s temporary construction works. BC Hydro announces shortlist for Site C balance of plant contract. BC Hydro issues RFSQ for Site C balance of plant contract. The balance of plant RFSQ can be found on BC Bid at www.bcbid.gov.bc.ca, document number RFSQ 9066. BC Hydro is collecting your name and email address in order to send you email updates about the project and/or construction bulletins on the Site C Project. This personal information will be used only for the purpose of sending you news and information about the project and/or construction activities. All personal information collected is done in accordance with BC Hydro’s mandate under the Hydro and Power Authority Act, the BC Hydro Tariff, the Utilities Commission Act and related Regulations and Directions. If you have any questions regarding the Site C Clean Energy Project, and/or how your personal information will be handled, please contact the Site C Clean Energy Project at 1 877 217 0777. BC Hydro Copyright © 2017 Site C Clean Energy Project. All Rights Reserved.